Synetic’s Patented Virtual Data Annihilator™ platform Wipes Drives at Our Site or Your Site to Recover Maximum Value from Off-Network IT Assets. Out patented solution addresses the limitations and risks of the DIY method efficiently and cost effectively. Our solution also gauges the health and reliability of each device which delivers greater value recovery because the secondary market trusts drives from Synetic. 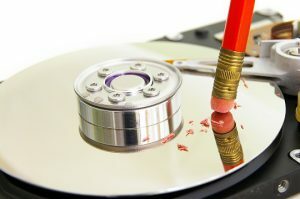 When drives fail health tests due to bad physical sectors, there is still the possibility that data exists that can’t be wiped, and the drive is shredded. Synetic offers both Virtual and Physical Data Destruction Services under the Data Annihilator™ brand. Data Annihilator sets Synetic apart from other IT Asset Disposition firms. Rather than pay licensing fees to a 3rd party software provider for certified data destruction on each device wiped, Synetic decided to innovate by patenting our own platform to deliver Enterprise-class data erasure efficiently and cost effectively which in turn delivers greater value to our clients. Data Annihilator’s infinite scalability, and flexibility to deploy onsite, allows for custom tailored data destruction programs to meet the data security needs of any client. Along with Data Annihilator, which wipes drives by default using current NIST 800-88 standards, Synetic also designed a separate system purpose built for quality control. Our custom solution automates the testing of sectors wiped by Data Annihilator to verify a full sanitization occurred, and exceeds NIST 800-88 standards for sectors tested to provide an extra level of assurance to Synetic clients. Synetic captures information from each Sanitization and Quality Control session including drive serial number, drive manufacturer, drive size, and logs of the wipe which are catalogued and made searchable via a centralized web portal for clients. Additionaly, Synetic provides notarized Certificates of Data Destruction to clients which are available via the Synetic client portal.